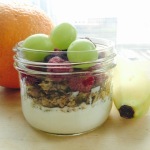 Yogurt Parfait – Dr. Melissa Lee ND., RAc. The combination of flavours: sweet, sour, and salty all in one bowl is always an adventure. When you put a parfait together, the colours all combine to make a beautiful and tasty dish! Using goat yogurt instead of cow's yogurt will add a little more tart flavour to your bowl, but it will be easier on your gut! In a bowl, put a layer of goat yogurt on the bottom.